I don’t know why or what it is about Easter Candy: the colors, the designs, the pleasing egg shapes, the promise of spring, but for some reason during this specific candy season I feel compelled to ignore my better instincts and try the grossest and oddest stuff I can get my hands on. 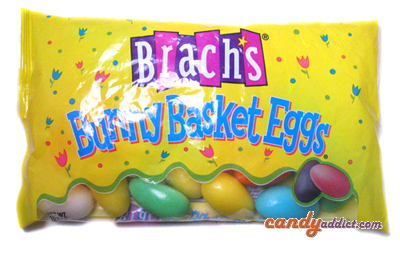 Last year I reviewed Brach’s Chicks and Rabbits, which are like the rejects of the circus peanuts. This year, my fancy was caught by these odd, large, brightly colored eggs. I mean, picking up the bag, it feels heavier than what it looks like it should be. Is this a good or bad sign? I could only shove my good judgment into my back pocket and throw the bag of these babies into my cart. I mean, come on, I’ve had some pretty strange things before. So how strange could these really be? I have to admit, I’m a bit of a novice to a lot of the Easter Candy out there. My parents, or rather, the “Easter Bunny” preferred to give chocolate rabbits, dyed eggs and Jelly Bellys. So I was never given the pectin jelly beans that everyone goes mad over this time of year. I also never got any of the malted robins eggs, marshmallow Peeps (gasp! I know!) or the purely sugar-based confections like the Bunny Basket Eggs. I mean, I think it wasn’t until high school that I had my first Cadbury Creme Egg! Looking back on it, I’m wondering how hindered I was by this, considering how my love of candy has grown to epic proportions.